I spent 5 days at Disneyland (2 days) and California Adventure (3 days) with my wife and 2 children (ages 6 and 9) which included New Year’s Eve which I understand is the busiest day of the year. Thank you for your excellent software. It made a great holiday even better. And thank YOU Leon for sharing. I’m glad you had such a nice trip, and that RideMax could help! On to the parks… I decided to stop into Disney’s Animal Kingdom again last Friday, February 12th. I have to confess that I’m somewhat obsessed with the new Rivers of Light show coming soon to the Animal Kingdom, so I wanted to see the construction progress since I last checked things out two weeks ago. Before we get to the Rivers of Light, though, I wanted to point out that the parks have seen some pretty decent crowds over the last week or so. 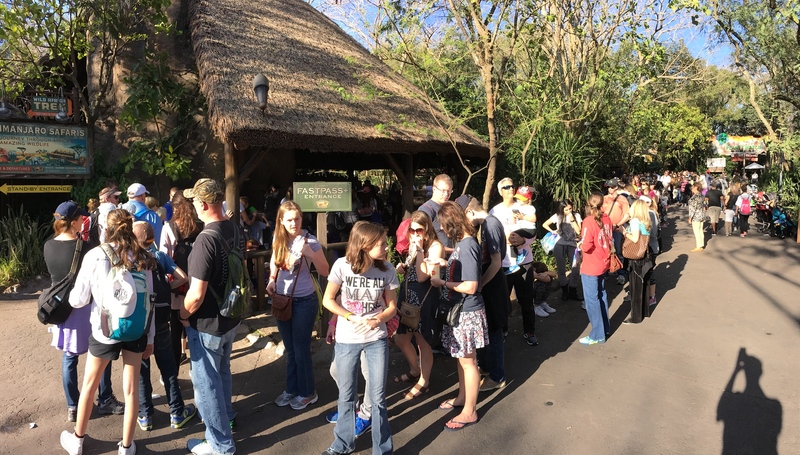 The picture above shows the wait at the Safaris on Friday at 4:35 in the afternoon. Not something you’d really want to mess around with if you could help it. Above is the queue for the FastPass+ entrance at around the same time, which goes into the “hut” on the left, and extends back outside to the right of the frame for about as far as the eye can see. 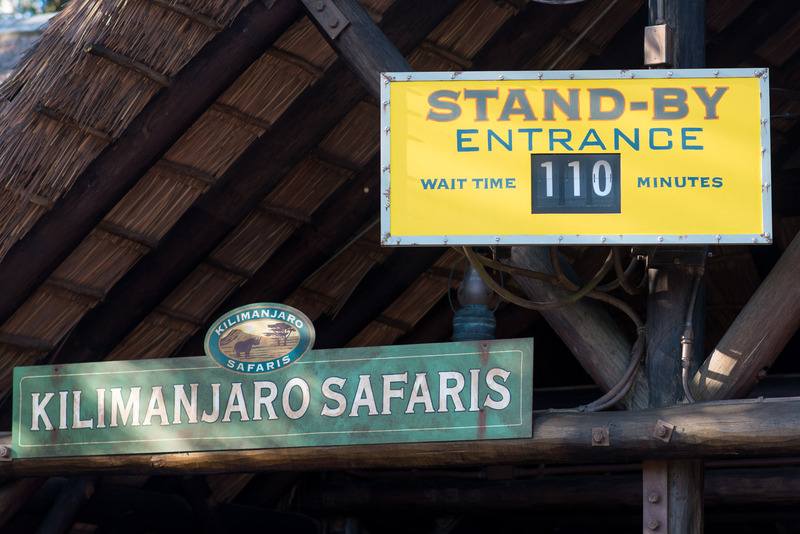 The lines for the Safaris can sometimes get backed up due to animals on the roads inside the attraction itself, but even so, this is a bit crazy. “But isn’t February supposed to be a low-crowd time of year?” you might be asking. The answer is, it depends. Normally, the first half-ish of February will see some low crowds, but you still have to avoid the dreaded Presidents Day week in the middle of the month, and especially that weekend itself (this applies to both Disneyland and Walt Disney World). 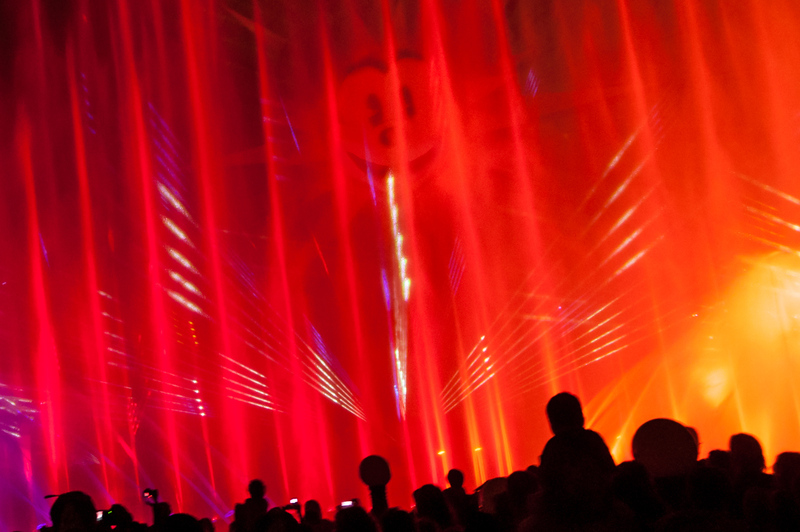 In addition, Mardi Gras falls somewhere in February or early March, and for Disney World at least, this brings in extra crowds as well, as Louisiana schools are normally on break for the entire week. Things can REALLY get crazy in years when both Presidents Day and Mardi Gras fall in the same week, but fortunately, this didn’t happen this year, as Mardi Gras was last week, and Presidents Day this week. (For those planning WAY ahead, the next time this overlap occurs is in 2021, just in case you want to make a note to stay away — or to get those ADRs lined up early.) Still, this past weekend was sort of an overlap of the two events, with crowds still in town from Mardi Gras week and folks getting an early start on PD week. OK, on to the Rivers of Light construction. Above is a picture taken over the construction wall just outside the entrance to the Finding Nemo show building. As you can see, there is still a fair amount of work to be done here on the near side of the river. Also of note in the image above, the aisle downlights appear to be turned on and working, which indicates some very decent progress on that side of the river. 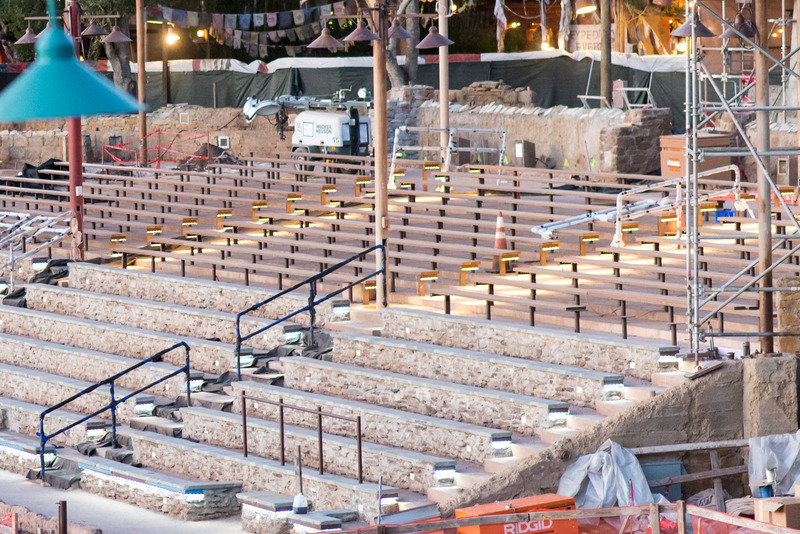 Above is the obligatory panorama showing the entire seating area. We’ll check back again periodically as construction continues here, so do come back again soon if you want to follow along. 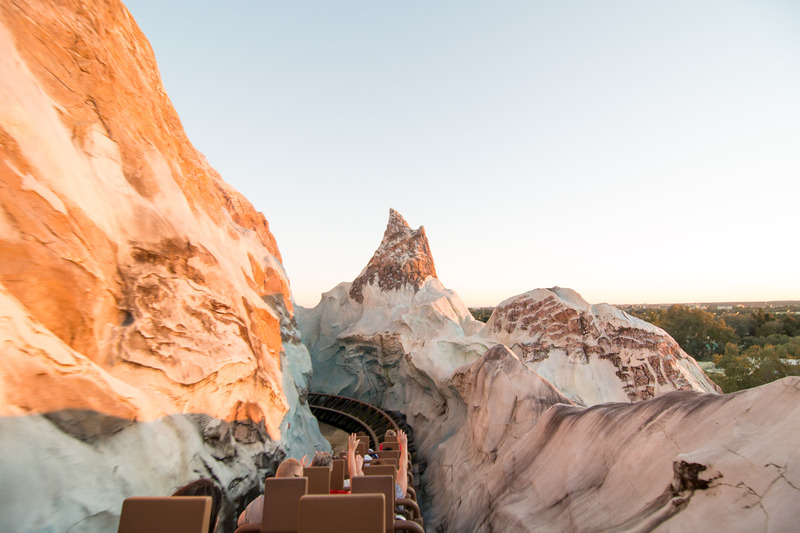 What visit to the Animal Kingdom wouldn’t be complete without a quick ride on Expedition Everest? I used FP+ and boarded right around sunset, which offered this nice view to the left as we neared the top of the mountain. 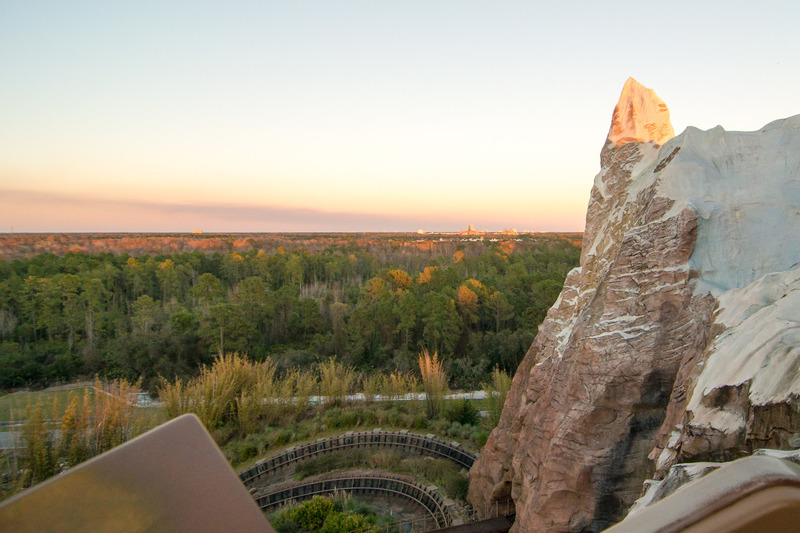 You can almost make out the Swan/Dolphin hotels and Spaceship Earth off in the distance. Always a beautiful view up here. Don’t ask me why, but sort of like ordering steak at a seafood place, I ordered the chicken salad at a BBQ place, and basically got what I deserved with this, the Jamaican Jerk Chicken Salad. To cut straight to the chase, I didn’t really enjoy this very much. 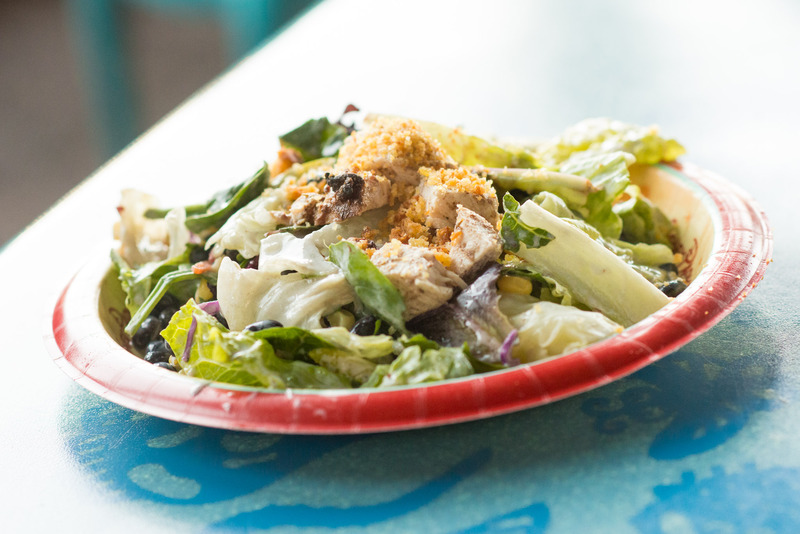 The salad base is composed of mixed greens, but mostly iceberg lettuce. Black beans and chicken topped with ground croutons (or something similar) round it out, but I just didn’t find it terribly flavorful. The dressing was sort of bland and didn’t add much to the overall experience here. I give this 2 out of 5 stars overall. On the other hand, I really enjoyed the Lime Mousse. At $4.59, it did seem a bit overpriced for the portion size, but the flavor combination was decent. Nothing too surprising here, which I guess is a good thing. This is basically key-lime pie filling and whipped cream on top of a graham cracker-based crust. 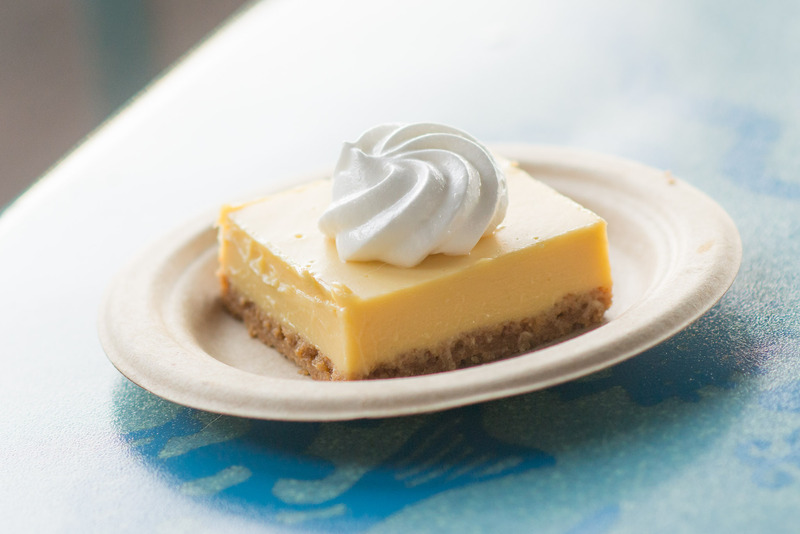 If you enjoy key-lime pie (as I do) you’ll find this a perfectly respectable dessert. It would just have been better after one of the BBQ meals on the menu, rather than the salad. One thing I’m looking forward to with Rivers of Light coming to Animal Kingdom, is the potential for much later closing times. 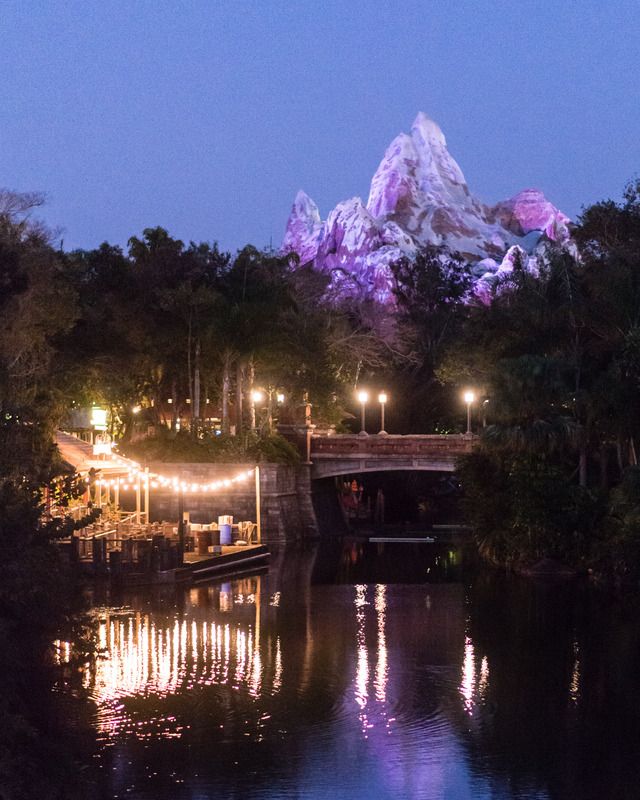 There is something magical about the Animal Kingdom in the early evening and nighttime. 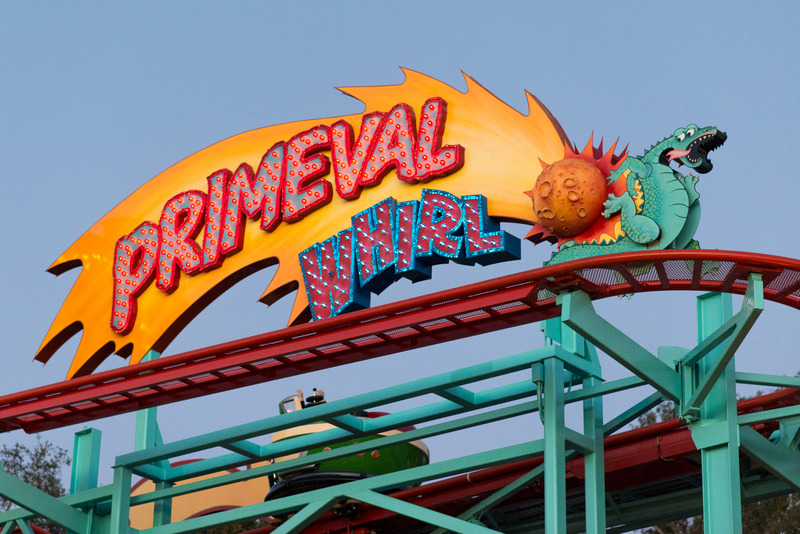 Even Primeval Whirl looked sort of cool with its lights on in the early evening. 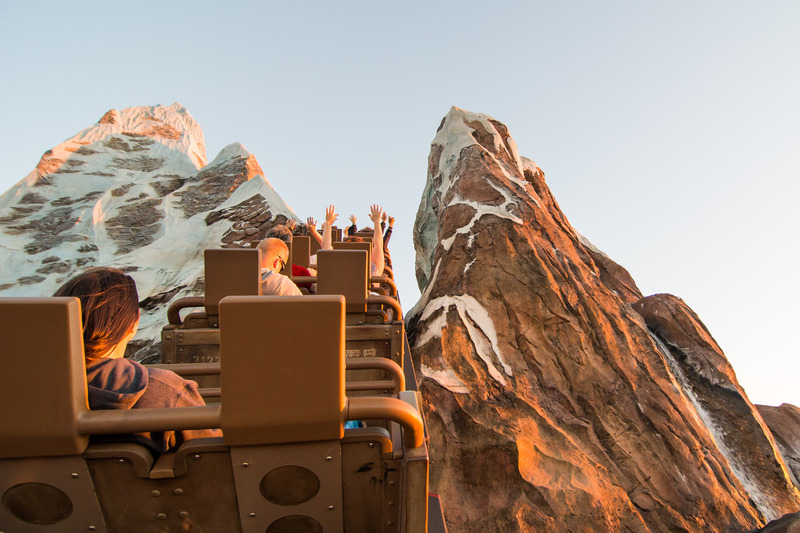 I didn’t have my tripod handy, so this shot of Everest in the early evening will have to do, but hopefully you get the idea of the potential for a really cool atmosphere around Animal Kingdom when it starts closing after dark on a regular basis. 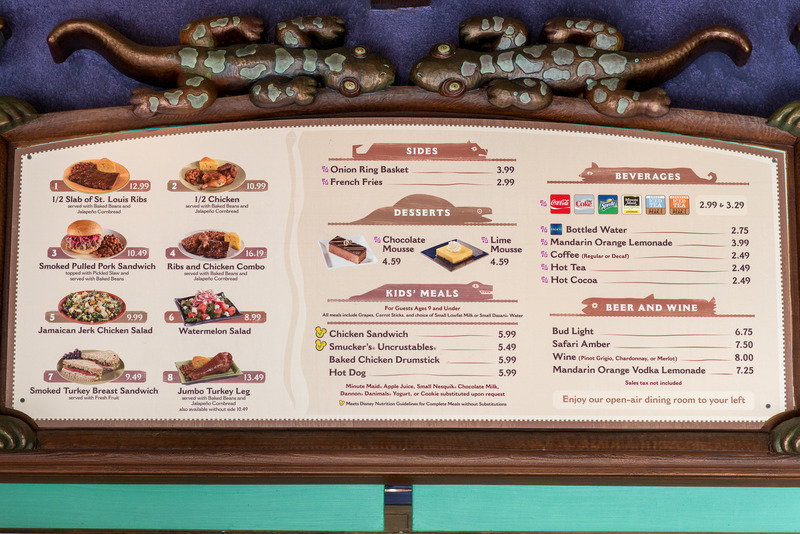 Coming up, I’m hoping to pay a visit to Epcot this week, complete with a Periscope broadcast of rope drop. Feel free to follow me on Periscope if you’re interested in seeing the process I like to follow in making my way to Test Track right when the park opens. And as usual, if you have any comments, questions, or suggestions, please feel free to chime in below. I’ll do my best to respond!